A 19-year-old gunman has killed 17 people and injured many more after opening fire at a high school in Parkland, Florida. Police say Nikolas Cruz, an expelled former student, was heavily armed when he began his Valentine's Day rampage. Here's what we know about what happened. Students and staff at Marjory Stoneman Douglas High School reported hearing "what sounded like gunfire" shortly before the end of the school day on Wednesday. The gunman entered the school premises - about an hour north of Miami - wearing a gas mask and carrying a rifle, ammunition cartridges and smoke grenades. He set off a fire alarm so people would leave the classrooms and pour into the corridors. 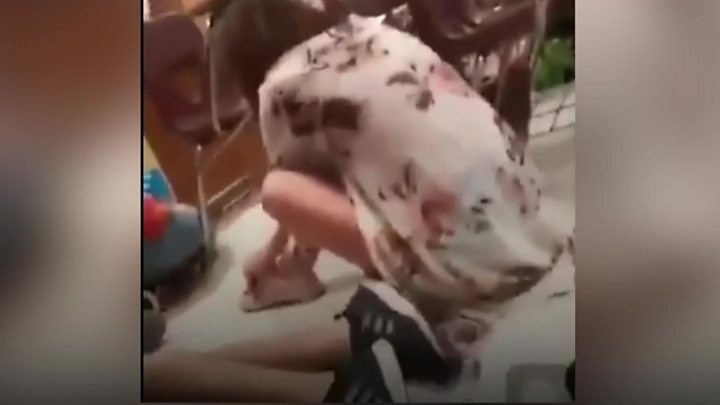 Many students thought it was a drill because a fire alarm practice had taken place earlier that day, but then they heard the sound of shooting. "I heard about six gunshots and then some people started running," Student Jeiella Dodoo told CBS News. "And then everyone started running because we were like, 'If it's real, then just run.'" The gunman, firing multiple times at students and teachers, killed three people outside the school, before entering one of the school's teaching buildings and killing another 12, Broward County Sheriff Scott Israel said. Two others died of their injuries in local hospitals. Witnesses described how students hid anywhere they could as the shots rang out in the building, which houses 30 classrooms. Survivor Kyle Yeoward, 16, said he and about 15 other students and a teacher hid in a storeroom for about two hours until police arrived. Police said the gunman had been carrying an AR-15 rifle, which he had bought legally, and several magazines of ammunition. Police and Swat team members swarmed the campus and began clearing students from the school. Parents and ambulances also converged on the scene. Students were led off the campus by heavily armed police officers. The gunman, concealing himself in the crowd, was among the hundreds of people fleeing the building, authorities said. Nikolas Cruz, who had been expelled for "disciplinary reasons", was captured by police in the nearby town of Coral Springs, just a few miles from the school, about an hour after the attack. He was taken to a nearby hospital before being released into police custody. How does the attack compare? Wednesday's shooting is the worst school shooting since 2012, when gunman Adam Lanza shot dead 20 young children and six adults at Sandy Hook Elementary School in Newtown, Connecticut. It is also at least the 18th shooting in the US this year on or around school premises, according to research by Everytown for Gun Safety.